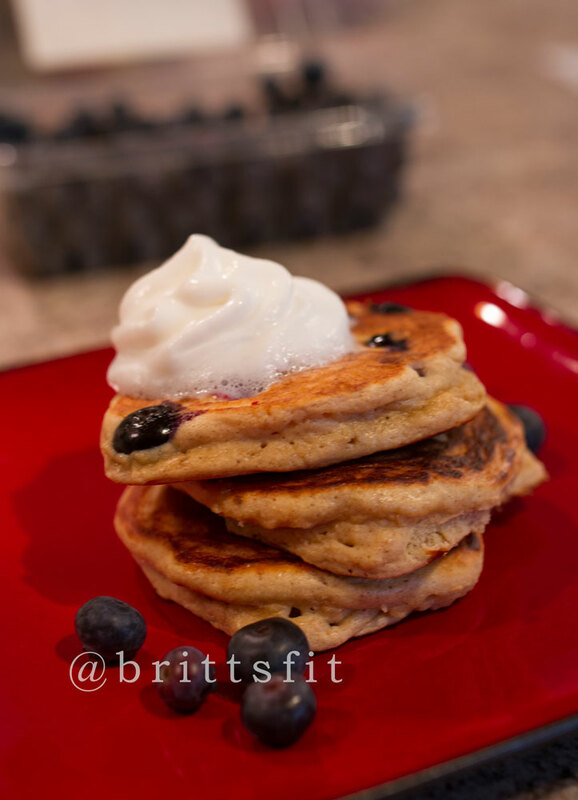 Easy protein pancakes? I’m in. After quite a long time now of eating healthy, I have tried many recipes for protein pancakes. I have become somewhat of a connoisseur if you will. Some are definitely better than others. I have found that many of the recipes can be dry to the point I can barely swallow them. Others just taste bland and boring. While yet another negative aspect is that many of them take quite a long time to put everything together. Then you have to cook them on low and it can take quite a while before they are ready. That is fine if you are not in a hurry, however on days you are in a rush they usually aren’t going to cut it. 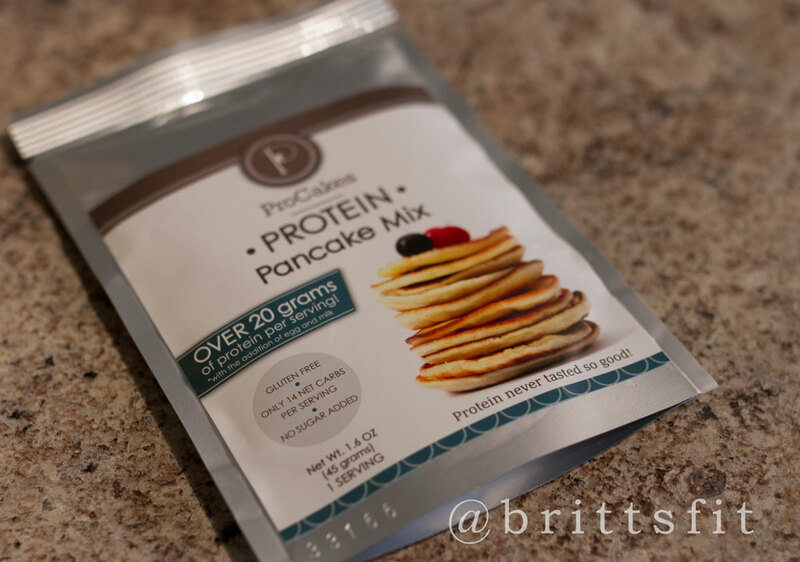 So when I heard about ProCakes premixed protein pancake mix, I was intrigued. With this mix you only have to add milk and an egg. I was a little skeptical at first because of many of my previous experiences but I am pretty open to new things so I decided to give them a shot. I was offered a sample of this mix from ProCakes to try and review (unpaid) so what did I have to lose? In a few minutes, I had protein pancakes that were ready to eat! I have to say I was very impressed with this mix. The taste was amazing with a light, buttery type flavor. The texture was light and fluffy and not too dense at all. 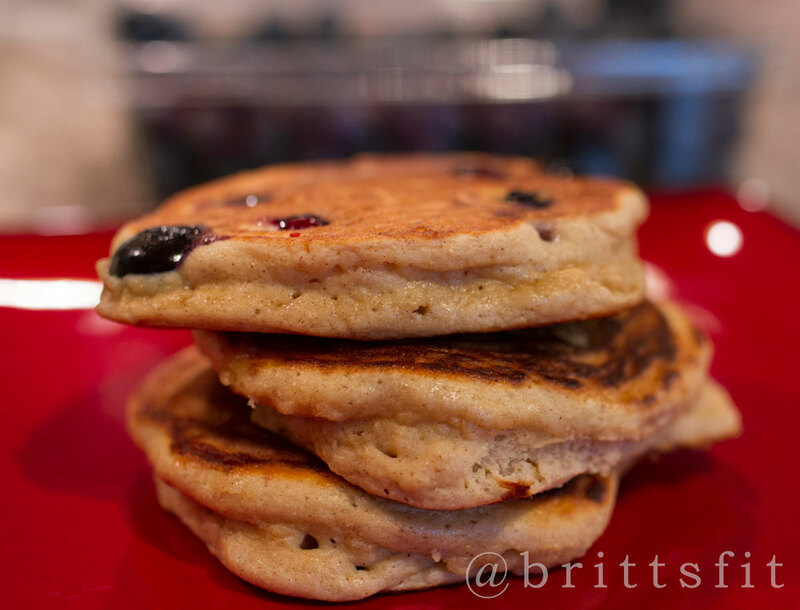 The taste of these was very comparable to “regular” pancakes. It was quite a surprise! I added some blueberries to one of mine as well to see how that would work and it turned out perfectly (some recipes get weird when you add fruit!). Also, for my Celiac friends, these pancakes are GLUTEN FREE!!! Did I mention these have no added sugar? NICE! *I was sent this sample from ProCakes to give an honest review. I was not paid to endorse the product. Cake. Birthday cake to be specific. I love it. I used to eat those Funfetti cupcakes ALL OF THE TIME. Probably why I gained weight in the past. However I still have a love of cake and that flavor which is why Cellucor’s Corfetti protein powder has been my favorite protein powder that I have tried so far. 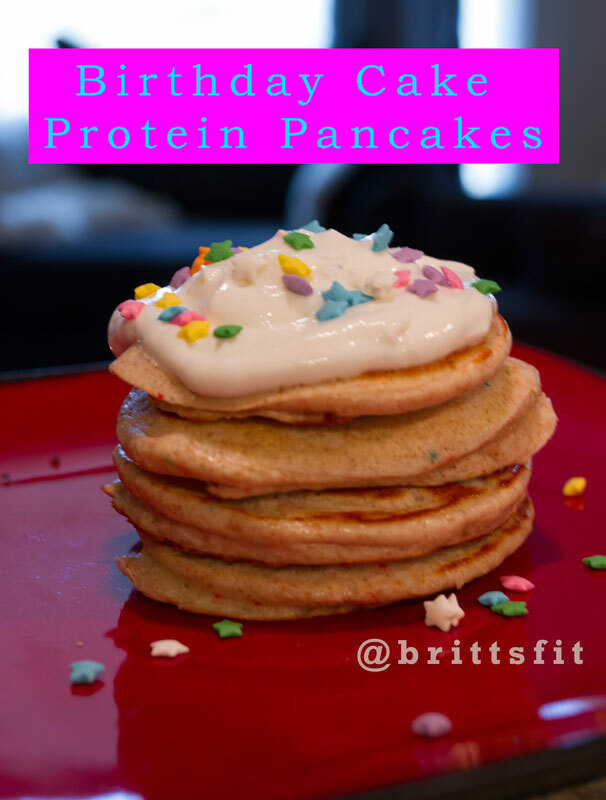 The flavor is amazing so I knew it would be great for protein pancakes. I used a recipe I found on Spoonful of Fit’s website. The recipe was for Whipped Vanilla Pancakes but I adjusted it. 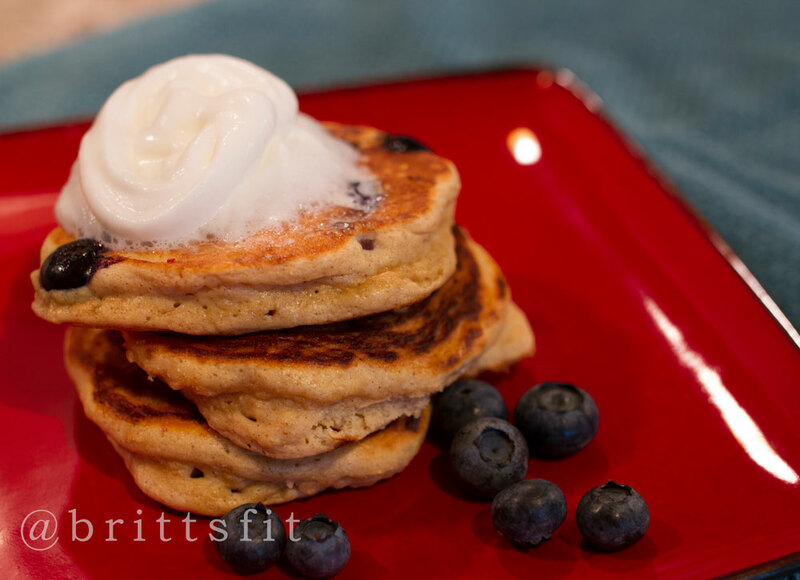 Here is the original recipe: http://www.spoonfuloffit.com/2014/02/whipped-vanilla-pancakes.html. Mix all dry ingredients first. Then add all other ingredients and mix until everything is mixed well. Cook on low heat on a pan sprayed with cooking spray or coconut oil. I made 4 small pancakes with this recipe. I topped these with more greek yogurt (about 1 TBSP) that I had mixed with stevia (to taste) and another tablespoon of the Corfetti protein (1 TBSP). 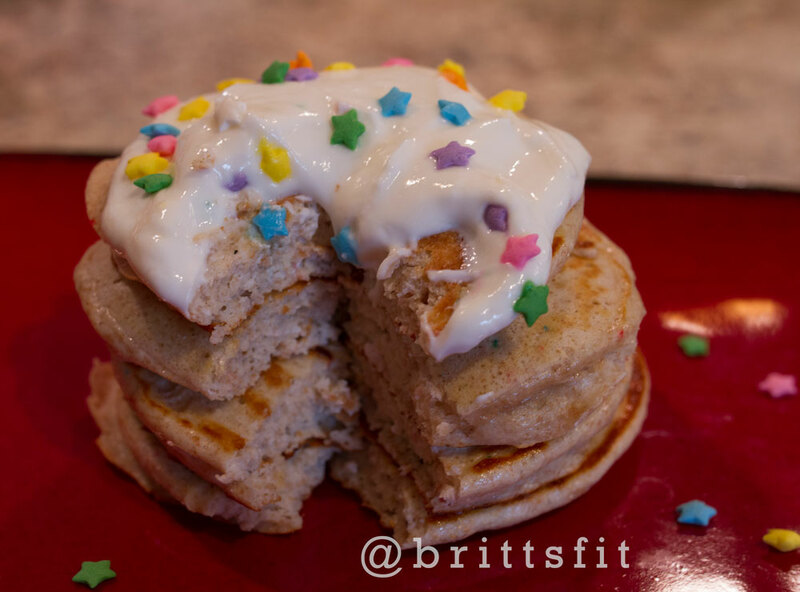 Enjoy your healthy and protein packed birthday cake pancakes! Calories: 252, 2f, 26c, 31p, 5f. I have really been feeling the protein pancakes/waffles lately. For one thing, there are SO many different recipes. Plus you can use a million different toppings to create different flavors so they don’t get boring! And they are really quite filling and satisfying. This recipe was actually really easy-which I love at 6am when I am making my first breakfast after my workout. Sadly I was not paying attention and burned mine, but they still turned out quite good. 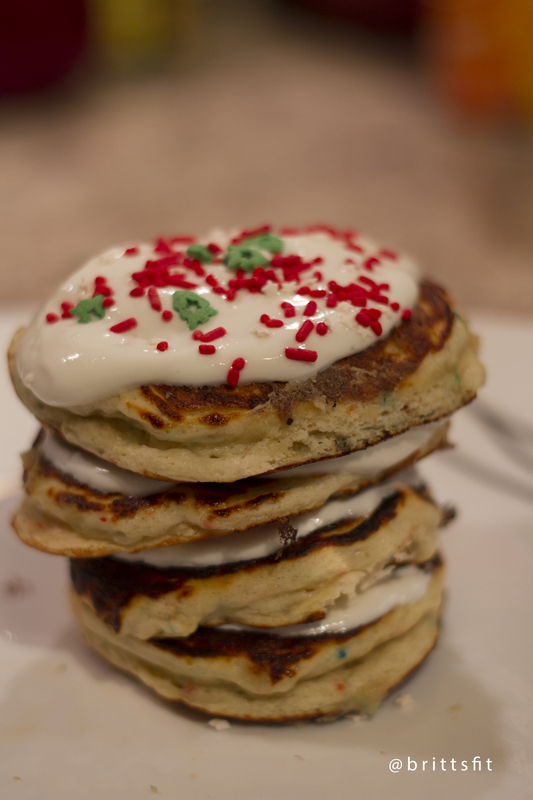 Also, I was out of regular sprinkles so I had to use Christmas sprinkles. Gives them quite a festive touch! Mash the banana in a bowl until it is fairly smooth. Mix in all of the other ingredients. Cook on a skillet or pan on LOW using coconut oil or cooking spray. Remember banana pancakes burn easily so make them small and do not cook them on high because they will burn on the outside and still be gooey inside. As usual I topped these with a mixture of greek yogurt and stevia. 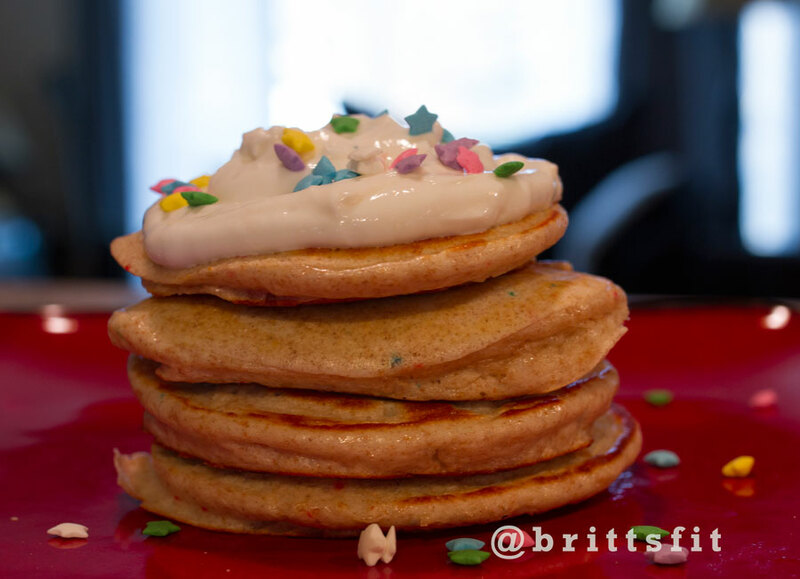 I of course, had to add sprinkles to go with the cake batter theme! Hope you enjoy these protein packed little gems.